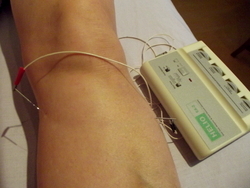 Authors of a study undertaken in Korea have concluded that electro-acupuncture should be recommended as a non-pharmacological treatment for the pain of diabetic peripheral neuropathy. A total of 126 patients with the condition were randomly assigned to either electro-acupuncture or to a non-treatment control group. Treatment was given twice a week for eight weeks. Both groups were given dietary and lifestyle advice, diabetes medication and painkillers (paracetamol) to use when required. Patients in the treatment group showed significantly more improvement in pain scores compared to those in the control group: 16% of treatment group patients had a greater than 50% reduction in pain score, compared to only 6% in the control group. The treatment group also experienced significantly greater improvements in sleep and quality of life scores. By week 9, 82% of patients in the treatment group were reporting global improvements, compared with 34% in the control group. This was maintained through eight weeks of follow up.